Miller® Gas Mixers - proportional gas mixers for welding and other industrial applications. Miller® Argon Flow Meter Regulator is ideal for most MIG and TIG welding applications where more accurate delivery of argon or argon/CO2 shielding gas is needed. Miller® CO2 (Carbon Dioxide) Flow Meter Regulator is ideal for most MIG welding applications where accurate delivery of CO2 shielding gas is needed. Miller® Helium Flow Meter Regulator is ideal for most MIG and TIG welding applications where accurate delivery of helium, argon, CO2 or argon/CO2 shielding gas is needed. Miller® dual flow meter regulator provides precise shielding gas regulation for multiple MIG and TIG welding applications. Smith® 35-30-320 is a high-flow, two stage CO2 (Carbon Dioxide) flowmeter regulator that provides consistent outlet pressure while avoiding freeze ups. 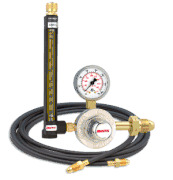 Genuine Miller® MIG Kit includes Smith® regulator/flowmeter with 10 ft (3 m) gas hose, 10 ft (3 m) 4/0 feeder weld cable with lugs, 15 ft (4.6 m) work cable with 600-amp C-clamp. Powerweld® PW-AH6 6 ft., single black inert gas hose with fittings for all your MIG and TIG welding applications. Powerweld® PW-AH10 ten foot, single black inert gas welding hose with fittings for all your MIG and TIG welding applications. Powerweld® PW-AH25 twenty five foot, single black inert gas welding hose with fittings for all your MIG and TIG welding applications. Genuine Smith® 15001-20 surge protector provides a constant 20 SCFH flow of shielding gas while preventing sudden gas flows into your MIG welder or wire feeder. Genuine Smith® 15001-30 surge protector provides a constant 30 SCFH flow of shielding gas while preventing sudden gas flows into your MIG welder or wire feeder. Genuine Smith® 15001-40 surge protector provides a constant 40 SCFH flow of shielding gas while preventing sudden gas flows into your MIG welder or wire feeder. Compact, economical Smith® single-stage flowmeter regulators provide efficient and accurate shielding gas regulation for MIG welding and TIG welding.